It's the first 'Bloom Day' of 2017 and I have no blooms to share....because everything is covered in about 7 inches of snow. Here's the RainyDay Cottage, blanketed in snow. Generally, this is the time of year when I celebrate my hellebore collection. Not sure what condition the plants will be in after this all melts. Prior to the snow storm, we had a week of very cold temps. Dry, frigid air laying waste to my pretty plants. The snow storm has already caused some damage. In this next picture, the 80+ year old, Chinese snow ball tree (viburnum macrocephalum var. sterile) planted by my husbands great grandfather, is overloaded by the weight of the snow. After trying to lighten the snow load, I realized the old tree had broken at the base. Turns out..it was rotting. So..the hubby got the chainsaw out (always a favorite moment for him) and cut down the old wood. Luckily, I've been letting a few new shoots grow over the past few years (to try and fill in the back). Those are healthy and this old tree will still keep on going....just in a very reduced way. Of my three cats, only one would venture out into the cold. That's right....Demon Cat turned into the 'snow cat'! One of the sweetest things about snow, is that it makes the world quiet, softening the sounds of everyday life. I love how snow can make tree branches stand out, like on my Twombly red sentinel japanese maple. However, now its like day 5 of icy snow.... and I'm over it. Happy Garden Bloggers Bloom Day! 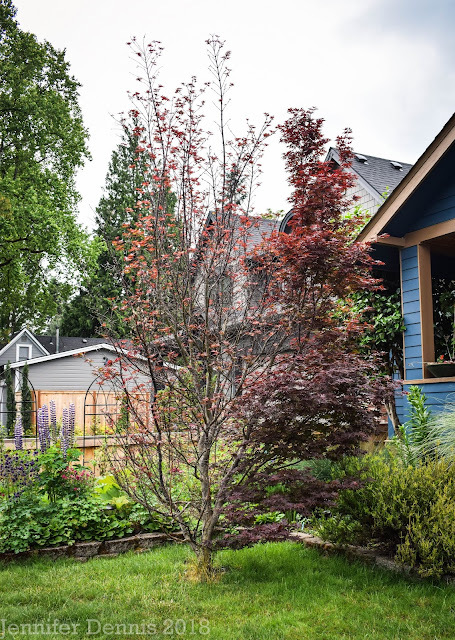 Visit Carol at May Dreams Garden to see what is blooming around the world. 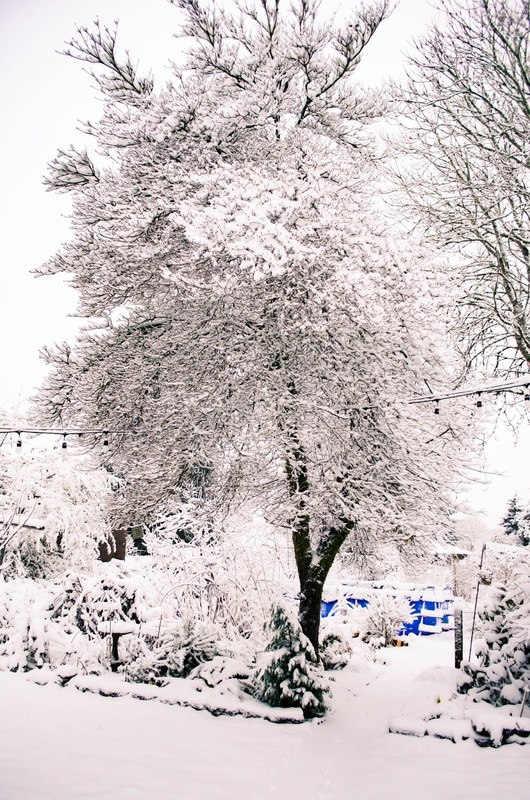 Beautiful snow scenes! But I would be tired of it by now, too! I hope so Lea, I really do! I'm sure the hellebores will survive and I am glad the viburnum is shooting. It would have been such a shame to lose it after all this time. It does look great. 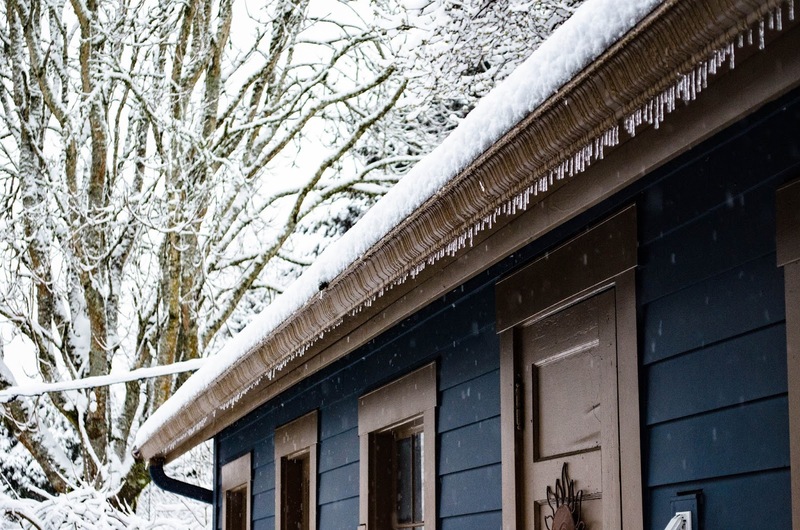 I love the color of your home, especially against the snow. 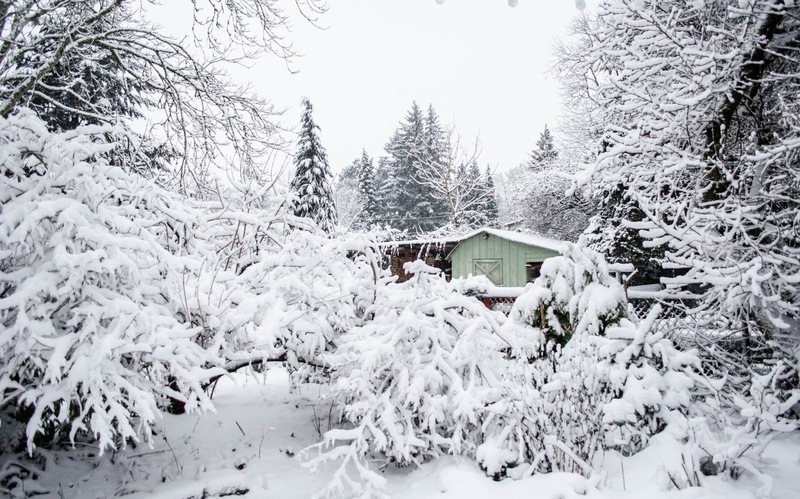 Your snowy views are beautiful Jennifer and your Hellebores are resting under the insulating blanket of white. Try to keep warm and hopefully your temperatures will warm up a bit. Happy Bloom Day! Beautiful photos! 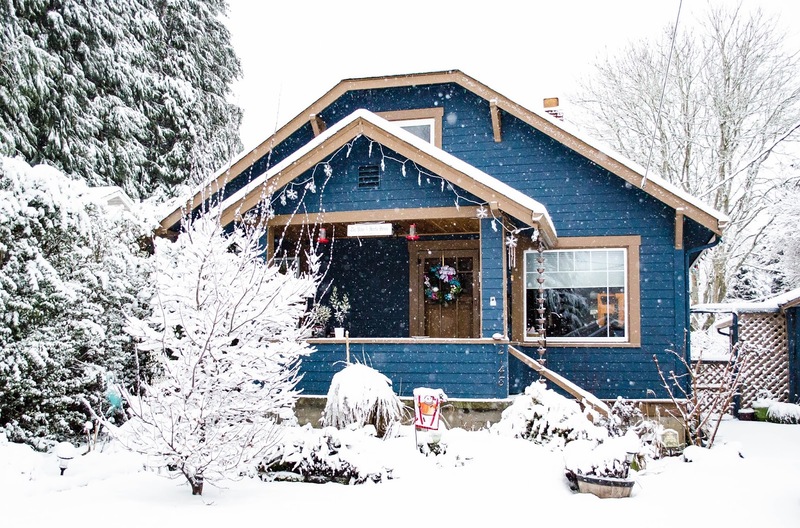 I love how your blue house stands out against the white of the snow. 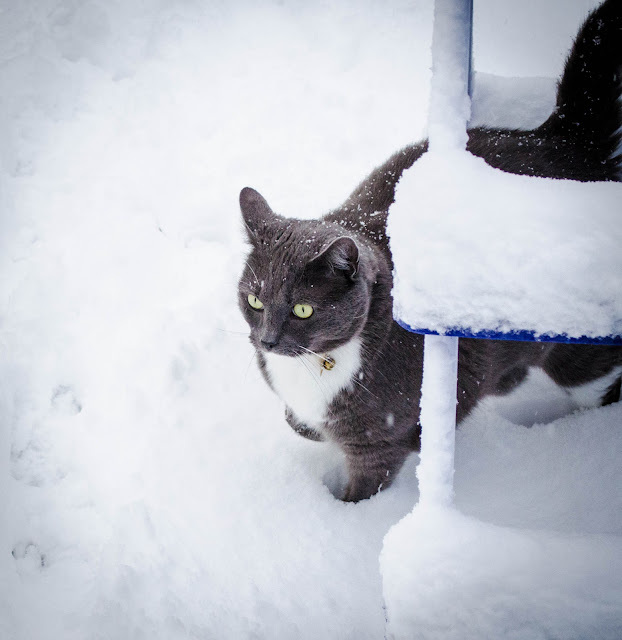 Kudos too to Demon Cat for braving the snow. (My cat won't even venture out onto rain-splattered pavement.) I'm sorry to hear what happened to your Viburnum but I'm glad you're prepared with offspring in the wings and that quick action prevented a total loss of the old tree. Best wishes for a warmer Bloom Day in February! You got some pretty shots of the snow. Your Hellebores will be fine. I used to grow them in Massachusetts. They didn't flower till much later, but they always survived the long winter under a blanket of snow. The bugger is that they've got blooms..so I'm worried they'll be mush or plain old ruined. They really are the plant that helps me get through winter. Beautiful snow pictures, and I love your coloured sheds, we've just had snow melt after it lay for several days at minus temps. From one extreme to the other we are now 10 Celsius, no wonder the plants are confused. 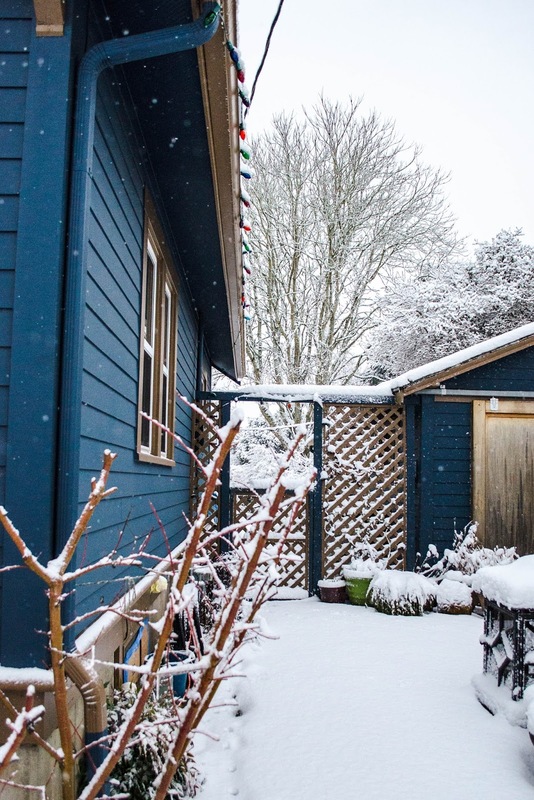 The falling snow looks so pretty against your blue house. 16" here and none of it has melted a bit. 16"...I will stop complaining now. You have so much!! Lovely photos! 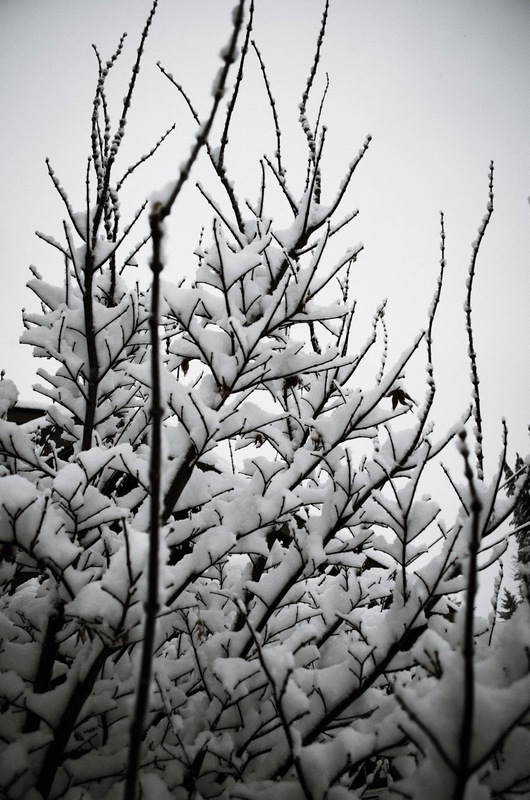 Snow will insulate plants, so it's supposed to be better to have that than just cold. My hellebores (Seattle area) seem fine and we've had cold without snow, the ground has been frozen solid. I hope you're right! I adore my hellebores and would miss them terribly if I had no blooms this year. In a way I'm jealous of your snow. 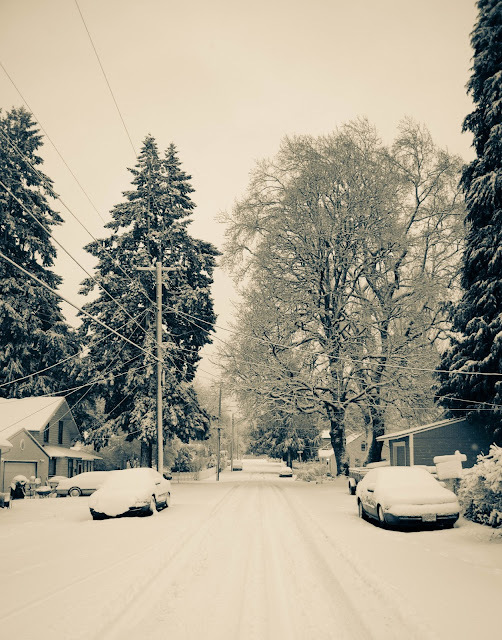 The quiet, beauty, and no school would be wonderful. We've just had cold dry weather which isn't half as nice. Spring gets closer every day! Five days is a lot, but it is very beautiful. Sorry to hear about the old tree though.